Editors Note – Sennheiser have always been off my radar when it comes to headsets, there is no reason for it, just that when i’ve had a need for a new headset Sennheiser have not been at the top of my list. But reading this inverview with the Senior Acoustic Engineer as made me think that it i should have a look wheni’m next in he market to buy. Sennheiser makes some of the best headphones in the world regardless of whether you want to pay $70 or $1500. Today, we’re lucky enough to have Sennheiser Senior Acoustic Engineer Axel Grell here to answer your questions starting at 1PM. Amongst Grell’s many accomplishments are the designs for Sennheiser’s super high-end HD 800 over-ear headphones and the new badass IE 800 in-ear monitors. To kick things off, we asked Grell to answer a few questions about the design of these beauties, but he’ll be hanging out in the discussion below addressing whatever is interesting to you. Now’s your chance to ask all your burning questions about the science of designing perfect sound. 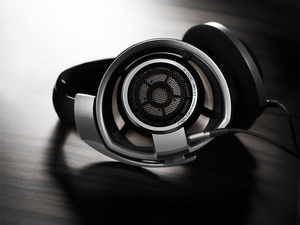 Q: The HD 800’s 56mm transducers—I believe that this is the largest dynamic driver in any headphones right now? As far as I know: yes! Q: What design challenges does such a big driver pose? Q: And why driver size is important in headphones? The larger the moving area of a transducer, the less movement he needs to make to produce a certain Sound Pressure Level. The less movements a transducer needs to make the lower is the THD. A second aspect: The natural sound field takes up a very large area around the head. To create a natural impression of the “room” it is necessary to radiate the sound as similar to the natural sound field as possible. This is the second reason for the big diameter and the angled position of the transducer. Q: What’s was the biggest challenge in designing the new IS 800s? IE 800? The biggest challenge was to design a transducers that covers the whole frequency range from 5 Hz to 46500 Hz. But it was definetely worth the work. It reproduces the sound without time differences what happens when you use a multi driver solution. The other thing is how to avoid the resonance that occurs when you put a earphone in your ear canal. The solutions is the dampened 2 chamber absorber. It leads to a smoother high frequency reproduction. Now you can hear r e a l heights instead of a peak at 7500 Hz! Q: Earbuds tend not to be very durable…what have you done to ensure that these will last long enough to justify the $1000 price tag. Do you see people using these on the go or at home? They are definitely designed for the use on the go—but you can use them at home as well. We have thought a lot about the durability of this earphone: we made the housing out of ceramics, build special easy to change easy to clean ear adaptors, build in two meshes to protect the acousics against ear wax and used a special very durable cable. We found that most of the defects of standard earphones are caused by broken cables. The defect is located close to the 3.5mm connection plug. So the lower part of the cable, from the plug to the divider is exchangeable. Now it’s your turn. What do you want to know about headphones and sound? Ask your questions below and Axel Grell will answer them. This entry was posted in Computers and Technology and tagged Sennheiser headphones, Sennheiser headset. Bookmark the permalink.